**No Landline Phone in this unit. Cell service is pretty good especially with Bellsouth or Verizon. Simplicity is a great place to stay at an affordable price. Simplicity has an open floor plan with plenty of windows to welcome in the natural light and warm fall colors. The cabin has an open deck to take in the distant mountain vistas. Fully equipped and decorated with casual country decor guests will find everything they could need as they lounge in the cabin. An impressive log bed is mingled effortlessly with casual bedding and accents with a touch of cabin decor tastefully added here and there creating an atmosphere that blends the best familiar comforts of home with the character and natural charm of cabin inspired furnishings. Feel free to cook a family meal in the stocked kitchen or cook out on the gas grill. We hope you will find Simplicity meets and exceeds your expectations. 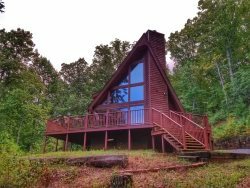 You can cozy up by the gas log fireplace on a chilly fall night or indulge in a movie night snacking on popcorn while watching your favorite DVD in the cabin's partially finished basement guests can play ping pong or enjoy the Wii video game console. The Toccoa river is just at the bottom of the hill and Horseshoe Bend park and just minutes away along with trout fishing. You are close to Toccoa River Outfitters. * Please note policy change regarding security deposit- You can choose between the $45 non-refundable accidental damage waiver or the security deposit. The security deposit covers accidental and/or intentional damage and excessive cleaning from not fulfilling the check out procedures. Proceeds from deposit will be refunded approximately 30 days after your departure. We had a great time and the cabin is in a perfect location, close to downtown. The kids loved the basement area like it was their own private home. We definitely enjoyed our stay. Everything was great much better that we expected it was nice and cozy we was enjoying the cabin so much that we almost did not leave to go out to explore the sights. Hopefully we will be able to do it again soon. I stayed in Simplicity with a group of four plus two hound dogs, and I could not be happier with our trip. This cabin is so relaxing and had everything we needed, from kitchen supplies to linens to games. The view out the back is beautiful, and the nearby town is too cute for words. Thanks for a great weekend! This was our 2nd time staying in one of Bryans properties. The cabin was in a great location with a nice mountain and sunset view. The cabin was very clean and well equipped and it was a great place for our family to stay. Highly recommend! Nice cabin about 20 min from downtown blue ridge. Property is spacious and a good value. Property could easily accommodate a family. Simplicity was perfect for a romantic get away. It was secluded, but only a mile from the small town(s) at the state line. Although there were only 2 of us, the cabin had plenty of room for two couples, and maybe even kids. They would be easily entertained in the basement with TV, video games, ping pong table. The interior of the cabin was nice and comfortable for just lounging around. Our dogs enjoyed being out on the wrap-around porch, and property surrounding when nature called. We would definitely come back to this place in the summer to enjoy the outdoors and the quaint town, and I could see us coming with friends since this cabin is very roomy. We had a wonderful time! The cabin was warm and inviting and the perfect spot for the four of us. It was very close to Rolling Thunder where we spent the day white water rafting. The beds were comfortable and the kitchen was well-equipped. The town of McCaysville has cute little restaurants and shops and we had everything we needed for a weekend getaway! Thank you! We will definitely be renting from you again. Bryan was a great host. My girlfriend and I had a great time. The cabin was beautiful and so was the view on the back porch. You can see all the stars in the evening on a clear night. The kitchen has everything you could possibly need. All you really need to bring is clothes and some food. Bryan was very flexible on the checkout date which was very nice. Honestly we didnt want to leave the cabin because we loved it so much. Overall we really enjoyed our stay and would highly recommend this cabin!